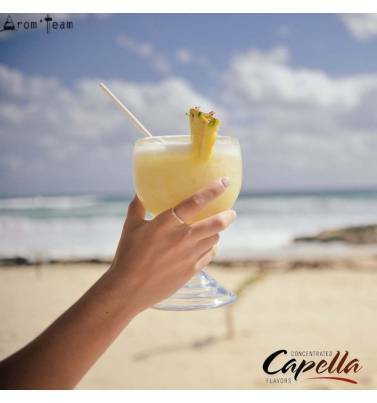 If you are fond of pineapple, coconut cream and rum, you will like this realistic Capella flavor. Close your eyes, you are vaping under the palm trees ! A Pina Colada cocktail without alcohol ! How do I make a Pina Colada? A holiday cocktail: rum with pineapple and coconut milk. This Pinacolada Capella is an enchanting and sunny stand alone flavor that makes an exotic vape juice. 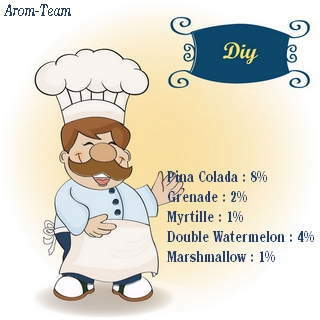 * Arom-Team review : a perfume more than convincing, a flavor very close to the cocktail, giving a true harmony between pineapple and coconut if the dosage is well respected. Do you feel the warm sand ? Do you hear the waves ? What is the best Pina Colada recipe? What dosage for this Pina colada flavoring ? What is steep time for this Pina Colada concentrate ? Is this flavor only for vaping ?